In compliance to Federal Government initiative of improving Nigeria business engagement climate and elimination of corruption in public and private practices, the Managing Director of the Federal Airports Authority of Nigeria, Engr. Saleh Dunoma, has begun to implement the Executive Order of the Acting President, Prof. Yemi Osinbajo to strengthen the ease of doing business in the country airports. This Executive Order is focused on removing all bottle neck that hinders easy flow of business and enhance government to private sector interfacing. Nigeria has for so long been a country where unnecessary bureaucracy has impeded business activities and of course for the airport business these uncoordinated systems create tooting, collection of bribes, security and safety breaches. The prompt response to this call for a change of order of doing things by the FAAN’s Managing Director is seen as a welcome development and will help to improve safety, security and passenger facilitation within and around the airport. Engr. Dunoma assured the Acting President of full compliance and has immediately put in place a multiagency machinery to ensure a successful implementation of the Executive Order which he will supervise himself. There shall be no touting whatsoever by official or unofficial persons at any port in Nigeria. On duty staff shall be properly identified by uniform and official cards. Off duty staff shall stay away from the ports except with the express approval of the agency head. The FAAN Aviation Security (AVSEC) and Nigeria Ports Authority (NPA) Security shall enforce this order. All non-official staff shall be removed from the secured areas of airports. No official of FAAN, Immigration, security agency or Ministry of Foreign Affairs (MoFA) or any other agency is to meet any non-designated dignitary at any secure areas of the airport. The official approved list of dignitaries that have been pre-approved to be received by protocol officers shall be made available to AVSEC and other relevant agencies ahead of their arrival at the airport. 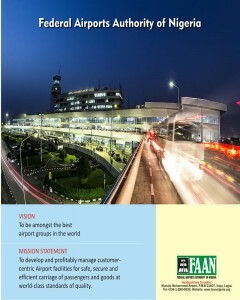 Following Airport Business News public opinion, the response by Engr. Dunoma is impressive but what is to follow is very important as most FAAN staff are known to create barrier between the authority and the private business concerns who are meant to be their partners. As one commentator said without a true and honest partnership between FAAN and the private investors the ease of doing business with FAAN will always be a mirage but hopefully the planned concession will change that and introduce a more business friendly airport business environment.